Nutrients from the environment drive bacterial growth, but are also toxic. Our team objectives are to discover and characterize i- transport systems used in Gram-positive bacteria to exchange environmental metals, lipids, and sugars, and ii- bacterial strategies that maintain the balance between nutrient benefits and toxicity, which adjust according to environmental states. Our common goals are to understand how bacteria maintain homeostasis of these components, and to determine how their functions impact on bacterial behavior. 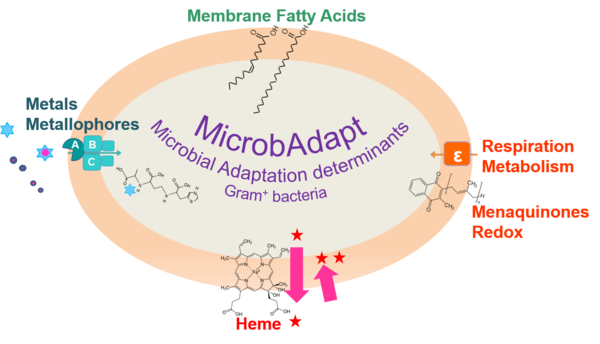 Characterization of the interactants and pathways that drive nutrient homeostasis is being applied to designing antimicrobial strategies. Our rationale is that blocking uptake or efflux of specific metabolites may be growth inhibitory for pathogenic bacteria. Our studies concern Gram-positive Firmicutes, mainly the pathogens Staphylococcus aureus and Streptococcus agalactiae, and the food bacterium Lactococcus lactis. Our working hypotheses are based on recent advances in our specific research areas summarized below by one key publication. Each theme is presented in descriptions of specific projects.